Interval: “a pause or break in activity.” Interval training is designed as focused rest periods between efforts of exertion. Too often, we neglect such focus because we forget the value of recovery. 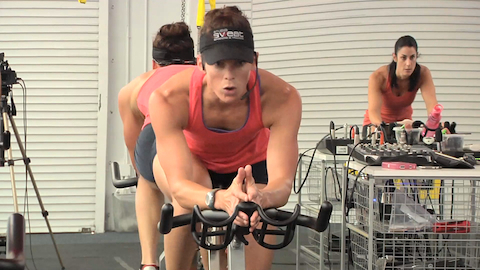 This low intensity interval Spinning class asks that you pay attention to the segments in between your effort. Listen to and slow down your breathing; use the interval to capture as much recovery time as you can. Just as nutrients are absorbed between meals, so too, fitness gains occur between exercise efforts. Let’s ride. My first class with Mike! Fabulous training. Great class, Mike! Loved the music, loved the ride. Tough interval ride! Saved to favorites! Love this class! Thanks, Mike! Really enjoyed the intervals and awesome instruction! Thx!! Yeah….I finished this workout this time! I tried this a few weeks back and had to stop. I felt like I was going to puck! As an instructor, you know you’ve pushed someone hard enough if they feel like pucking! But this time, I was able to finish the whole workout! This is a tough one! Nice job Mike…. This is a fantastic ride. Do not think this is a recovery ride because the focus is on the intervals. Love the music too!! Thanks Mike. MM2019. Great work out. I appreciated your added insight too! Awesome ride, Mike! I look forward to getting better and better! MM2019 another fabulous class from Master Mike !! 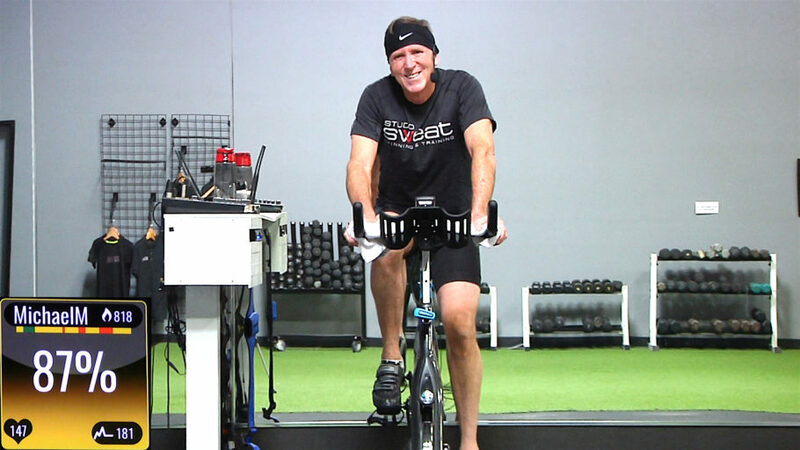 MM2019 … this was a great class … not at all a “recovery” ride, but a great reminder that resting is necessary for our bodies to build strength and stamina. Thanks, Mike! Chuck, I’m glad it was a “reminder.” That means you already get it and just have to practice being mindful. As always Gordon, I’m glad! After a 3 month break from cycling this winter, this class put me right back in the saddle with a smile on my face. Here’s to a successful “rejoin” Miss Heather!! Thank you Denise! I’m happy when you are happy. MM2019 Week 4 Cardio Class #1 Great class, thanks Mike! MM2019 – I love Mike’s classes! I love having classes! You make it fun! MM2019. What a wonderful Sunday morning ride with Master Mike! Great class–time flew by. Thanks Mike!! Time has mastery over our lives twice: At birth and at death. Everything in between, we own!! MM2019 – This class is terrific! Thank you!! MM2019!! My favorite spin class yet! Loved this ride and I was really working on my breathing. Never had a coach in a class talk about that before!! I’m finding more Mike!! This was fanfreakingtastic!!!!!! One of my all time favorite classes. Thanks Mike. “Fanfreakingtastic.” That is a powerful, one-word summary! Thanks! Loved getting back to my spin bike after a week of hiking and traveling. This class pushed me just the right amount of hard! Heather, Not to make you feel guilty but, bikes get lonesome when you are gone. Great workout and awesome pep talk/instructions! Blessings! The secret is, I talk, but you provide the “pep.” That’s why we make a good team. MM2019 love this ride. So tough! Thanks Mike! MM2019 As usual, loved the class Mike: great ride, great music and great stories! Thanks Dominique! I appreciate your comment! MM2019. Mike you truly are thee Master!! Incredible ride. I gave it all I had and then some. Those intervals felt like a god send! Thank you for always teaching us to better our ride. Thank you Cheri for the opportunity to help you pull from within! Great comment! Happy to be part of your journey! Mm2019-Needed this before my insane run tomorrow!! MM2019 Awesome burn as usual,, Thanks Mike !!! Thanks Alan! Glad you crushed it. A week off of any riding and I came back to this one. So glad I did! Love Mike’s classes. I am working and heart rate goes up but mysteriously relaxed at the same time. Isn’t it amazing how we can control the difficulty of effort without losing the benefit of the ride? Therein lies the secret to cycling! Excellent – Your instruction is very helpful and the music works well. “Awesome training” is on you! I merely instruct…you provide. Thanks Debra! Oh that was fantastic! I enjoyed all of the intervals and climbing. The space between baby! great ride Mike. The “space between” our rides is what pulls us back each time Liz. Glad you enjoyed it! BSP 1/3. Another great sweat session with Mike! MM2019 WK 3 first master mike class, wow pretty tough, learned what an interval really is! Welcome first timer! I hope you’ll join us again Nicole. Oh! Mike! I’ve missed you and your amazing playlists!!! Thank you so much! Great to be back! Thanks Wendy! Valuable information Mike! Appreciate the great instruction. MM2019 done yesterday, forgot to comment!! Great workout!! Love it, thank you for a great class and insight as well! Omg this was so different and great. Different isn’t always great, but great is always different! Thanks! MM2019- When Master Mike drops a new release you cancel all previously planned classes and press Play. He never dissapoints! Megan, I’m gonna make you my agent! Love the intervals!! And the instructions/reminders along the way were great for me as I prepare for more outdoor riding…thanks! Thanks Alicia! Here’s to the great outdoors! MM2019! really enjoyed this one! MM 2019 # 2nd cardio – Loved this one and learned so much. thanks! Great class, music selection made it feel relaxing. Jeanna, You’ve captured the art of a great ride — relaxing, yet rewarding. MM 2019. Love education focused rides. And a bit of humor, ok? Ok? Ok? Time on a rig lends itself to learning new or different ways of thinking. Humor also makes a ride sweeter. Intervals are the key, as you continue the campaign to educate us. Thanks for a great class. Awesome class!! Loved the intervals and your music is always amazing!! Thank you Master Mike!! Finding music that “fits” the ride in my mind….that is my favorite thing to do! Thanks! MM2019. Great class to get me going on this Monday morning! Went by fast. I appreciated the music tempos to keep my legs at the right speed. Thanks Mike! It’s all about the pace…. that will help you improve each and every ride. MM2019. Well that was pretty awesome. Tuff workout and so focused the time flew by! Thanks Mike! “Am I finished already?” That is the perfect thing to ask when you’ve crushed a ride! MM2019 always love conversations with Mike. Such great instruction. This was a perfect class today! Made perfect by your participation! Thank you. Thank you Susan! That beautiful animal in your picture is awesome. MM2019:great ride to start the work week. Thanks Mike! Your rides are always so informative. I love 💕 love 💕 love 💕 that. And I love, love, love that you love, love, love the ride! Aahh! Saying so much by posting so little. You are learning the art of Zen Ashley! MM2019 week 3, awesome ride mike, it pushed me that’s for sure! It pushed you — and you pushed back! That is the key to dominating a ride. Safety, when your young, is seldom an issue. Then wisdom comes along and starts to reveal reality. IO’m glad you can come close to replicating an outdoor ride. Part of me occasionally misses the road. MM2019 – Great class Mike as usual! When I saw this morning you had a new one out I couldn’t wait to get home to try it! Loved it!! The fact that you looked forward to a ride is a sincere compliment! Thank you! MM2019. Another amazing spin class from Master Mike! Thank You! MM2019 week 3 – cardio bonus.. HI Mike you e no idea how excited I was to see this in the library.. And once again.. You’ve schooled me.. It’s always a pleasure to ride with the Master!!.. Thank you.!! Thanks Andrew! Your kind words keep me inspired to ride with you all. MM2019 Great ride! Getting better with deep breathing during the intervals to bring my heart rate down. Jocelyn, You perfectly described the most valuable part of interval training — the rest! Thanks for riding with SSoD! MM2019. I absolutely loved this class and your coaching. Great format! I’m anxious to see my improvements over time with this class. Always a pleasure to ride with you. Thank you! I’m interested as well. Next time your ride (perhaps my next class), post an update! You’re a woman of few words Janet. MM2018 This was the best hour of my day! Mike said our takeaway from that ride should be to “work hard enough during the pushes so that the intervals become essential.” Im gonna post that on my bike console so I read it every day. I always learn something new form Mike. Loved this class!! Every hour on a bike is the “best” hour of any day! MM2019 – thanks Mike, I love you stories and coaching! Oh, and I forgot, I love your sense of humor! : ) Sorry I missed your live class, it was too late for me – I am usually half-asleep by 9 pm (EST). Hoping to see an early morning one?! MM2019 – love Mike’s classes and his words of wisdom! Great workout too! My pleasure! Thanks for riding. Oh! To be young again! 🙂 Happy Birthday! MM2019! Adding this to my favorites! Very challenging. Focused on the interval and breathing! Thanks Mike! I was demotivated and lacking in energy tonight and then I saw two words… ‘Mike’ and ‘interval’ so I knew I just had to get it done. Fantastic soundtrack as well! One of the best classes ever on SSOD! Nothing feels better than defeating procrastination! Props to you for stepping up. Time to ride, rok-n-roll!! This awesome express workout is 30 solid minutes of nothing but the road up ahead. Strong and steady stroke flats closing the gap between you and the riders up ahead… finishing with an 8 minute long steep climb where the “terrain” brings you in and out of the saddle. Work your gearing for the RPMs and push to your limits, but stay in control. Let’s rock this! 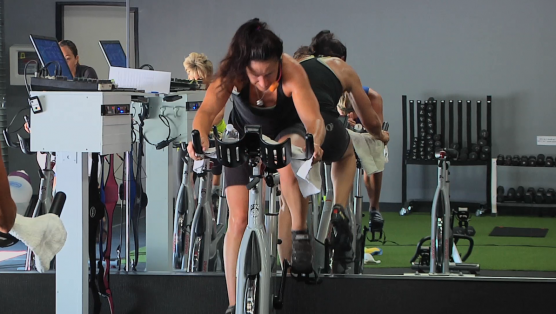 Iron woman Rebecca is going to motivate you to ride till you drop in this powerful StraightUpSPIN®! Plenty of interval and speed work with strategically placed climbs to maximize the burn! Watch the calories get crushed because your heart rate never drops during this one. Let’s go! What she means by that is that if you’re willing to get out of your comfort zone, you ARE going to change your body. Changing your body can, in turn, change how you think. It can change how you feel. But, often in order to take the steps necessary to change your body, you have to change your mind. Shift your attitude to understanding that it’s okay to be uncomfortable. That is how we grow. That is how we change. 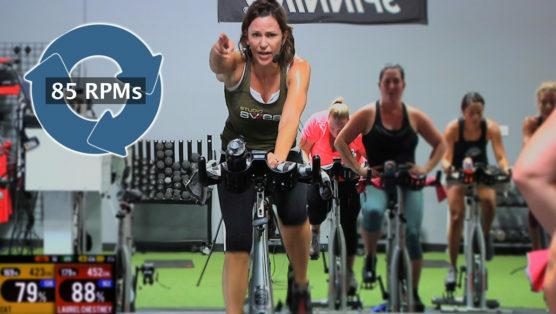 Now go after this amazing Spinning class with Cat, which she breaks into 3 heart-charging periods, each a little different – all challenging, but doable. You got this.